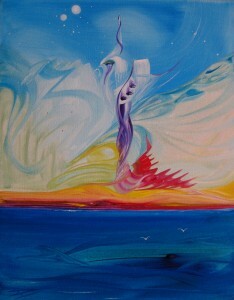 This song is based on two of my paintings: The Mystic and also The Muse. When Michael sent me the music I immediately saw these two paintings in my minds eye and called Michael and sent him the images to look at. It was a natural progression, from the visual to the song! I am the Mystic and Michael is the Muse. I am tuned into energies that have evolved over the years culminating into the channeling of my art. Michael is the one who resurrected the band, so he is my Muse. I LOVE this piece, we performed this on our recent Summer tour of the US and Canada, for which we received a standing ovation at every show. It was the most wonderful feeling for us and the other guys in the band. ‘Live’ it is extremely dramatic and powerful and is the beginning of more to come! This was inspired by ‘Carlos Augusto Souza’, a friend who passed away in December 2009. He lived in Brazil and had a warm glowing personality. It is about his love for life, his family and friends, his challenges and his joys! He left behind his light, to watch over the ones he loved. Posted July 31st, 2010 in The Mystic and The Muse.